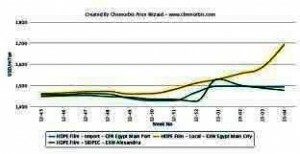 Egypt exported more than 11 thousand tons of homo PP to Turkey in the first month of 2013, which was a record high on a monthly basis for the country, according to ChemOrbis Import Statistics. Having been the fourth largest import PP supplier of Turkey throughout 2012, Egypt moved up to the second place in the list of top PP suppliers in January, overtaking Greece and India noticeably, although it still lags well behind Saudi Arabia. Back in 2010, Egypt had a minor market share of almost 1% in Turkey’s overall imports. Egyptian homo PP imports in 2011 posted a sharp increase and moved up by almost 7 times when compared to 2010. This was right in line with the stabilizing operations at the PP plant of EPPC as of 2011 after their start-up in 2010. Egypt’s market share in Turkey’s PP imports was a little more than 6% in 2011. In 2012, Egypt came after Saudi Arabia, India and Greece with a total of more than 70,000 tons of imports in Turkey, showing an increase of a little more than 7% on a year over year comparison. Although more import PP cargoes found their way to Turkey last year, Egypt’s market share did not grow much when compared to Turkey’s overall imports last year. On a monthly basis in 2012, the largest imports were made in March with more than 9,700 tons, which was followed by December with more than 9,600 tons. In January 2013, a much larger tonnage was reported with more than 11,000 tons, which was marked as a record high on a monthly basis for this origin. When compared to the same month of last year, it displays an increase of %13, meanwhile. In January, Egypt also left Turkey’s some of the major PP suppliers, namely Greece and India, behind with a remarkable difference. Its market share in January was almost the double of Greece, which was the third largest PP supplier in 2012 and it was four times bigger than India, which was in the second place. However, PP imports from Egypt were far from catching Turkey’s number one supplier, Saudi Arabia, which had an almost five times greater market share in January according to ChemOrbis. Egyptian Propylene & Polypropylene Co (EPPC) has a nameplate PP capacity of 400,000 tons/year. Since 2011, the proximity of the Egyptian source as well as its exemption from customs duties owing to the free trade agreement in place between two countries has been contributing to the competitiveness of this origin in the Turkish market.